Insight for Living Episode Reminder Get a sneak-peek into each new show, delivered straight to your inbox! Today's Insight from Chuck Swindoll Communicating the truths of Scripture and the person of Jesus Christ in an accurate, clear and practical manner. Charles R. Swindoll has devoted his life to the accurate, practical teaching and application of God's Word. Since 1998, he has served as the founder and senior pastor-teacher of Stonebriar Community Church in Frisco, Texas, but Chuck's listening audience extends far beyond a local church body. 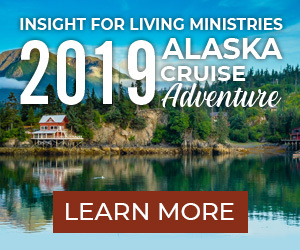 As a leading program in Christian broadcasting since 1979, Insight for Living airs in major Christian radio markets around the world, reaching people groups in languages they can understand. Chuck's extensive writing ministry has also served the body of Christ worldwide and his leadership as president and now chancellor of Dallas Theological Seminary has helped prepare and equip a new generation for ministry. Chuck and Cynthia, his partner in life and ministry, have four grown children, ten grandchildren, and six great-grandchildren.